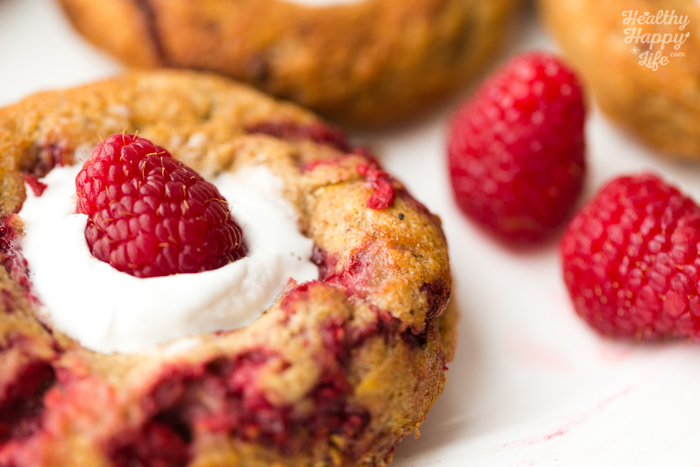 Fluffy Amazing Raspberry-Lemon Baked Donuts with Coconut Whip. 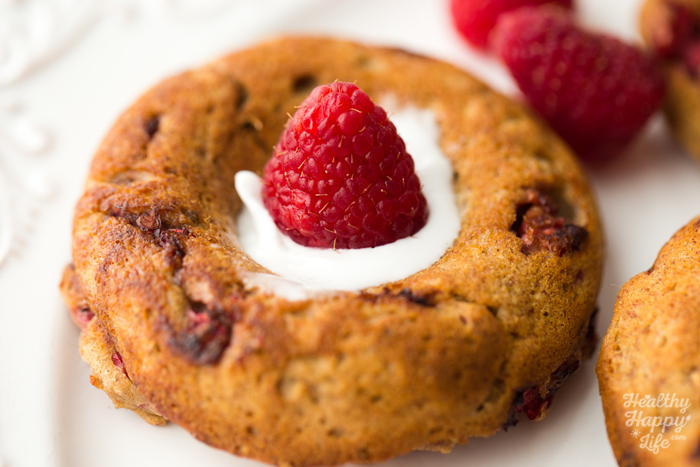 These delightful Baked Fresh Raspberry Lemon Donuts are sweetened with just ripe banana and Medjool dates, coconut whip on top. 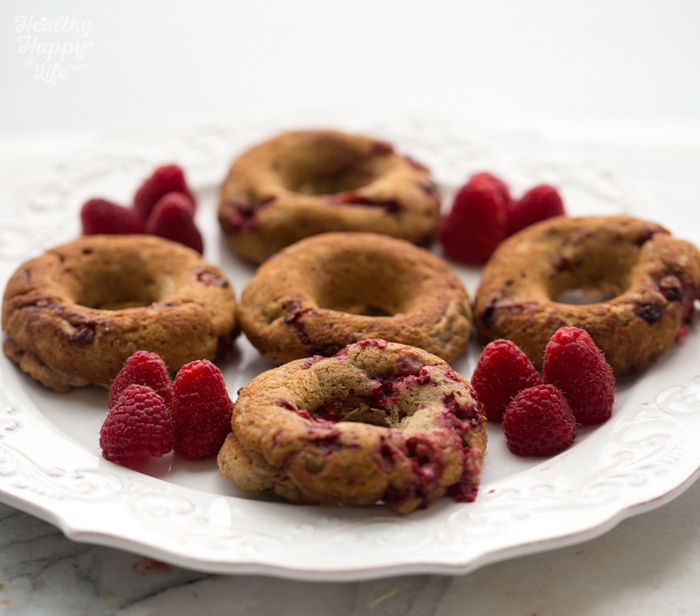 These amazing vegan donuts are baked and gluten free. 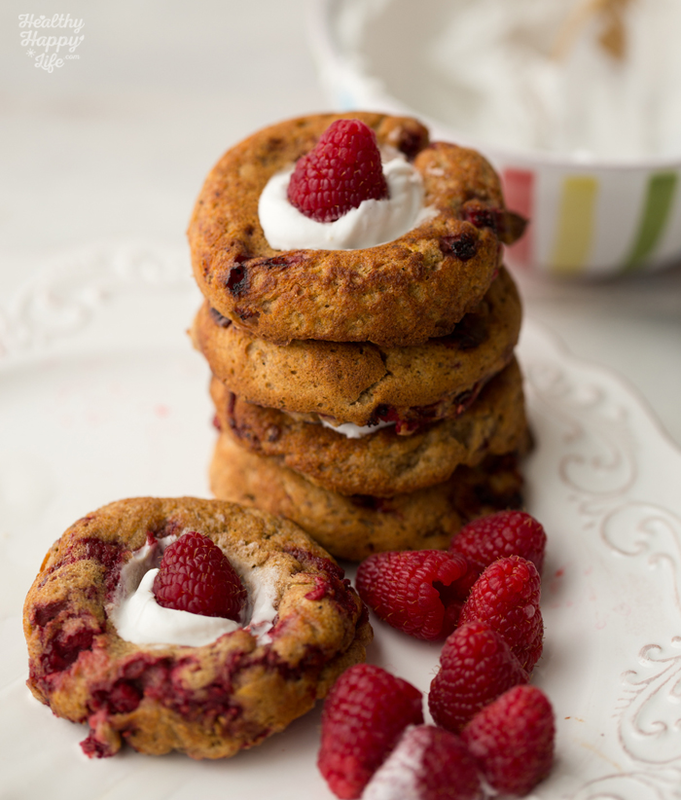 Give them a whirl for a healthy happy morning!.. Those crinkly baked tops, aka soon to be bottoms..
What a crazy few days it has been! I had an amazing cookbook launch party on Friday night (I will post all about it soon!) and then tomorrow I will be choosing the winners of my BIG cookbook launch giveaway. So be sure to check back for that if you entered! So NOW, after the past few months I am tired! OK, I had my lazy, do-absolutely-nothing day yesterday and now I am energized again to get back in the kitchen and continue bringing your guys vegan deliciousness, healthy-happy inspiration and some rays of sunshine. But I do admit, I am so happy to have most of the heavy duty cookbook planning and promotion fun out of the way so I can focus on just enjoying the book and indulging myself in checking in with you guys via Instagram, twitter and more to see how you are loving + trying all the recipes. Because in the end -- YOU AMAZING PEOPLE -- trying my recipes is what it is all about. And I cannot wait to share my P-A-R-T-Y pics with you guys soon! Planning a party was something that really challenged me on a number of levels. It is a lot of organizational work, as well an mental preparation! And for me it was very emotionally challenging to work up the courage to invite SO MANY of my most favorite people, many of whom I look up to in this industry and hope they like the party .. and hope they show up! I was so lucky to have some helpers along the way too. But anyways, more on that when I get the photos back from the photographer!! 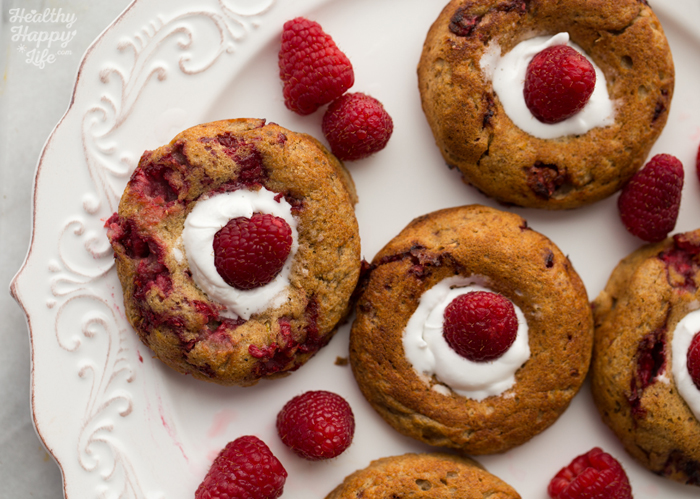 For this lazy Sunday ... baked donuts with fresh amazing raspberries and lively lemon accents. 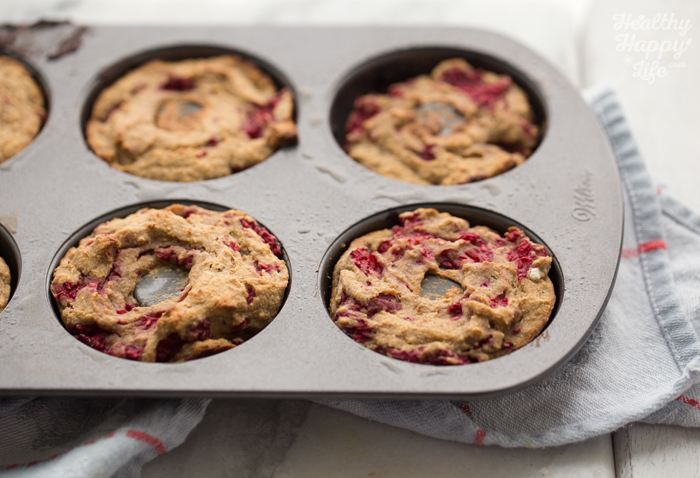 And ps... if you only have a muffin pan and no donut pan, that is fine too! This recipe will make a yummy muffin too. Just adjust baking time as needed. ..super healthy and these taste ah-mazing. 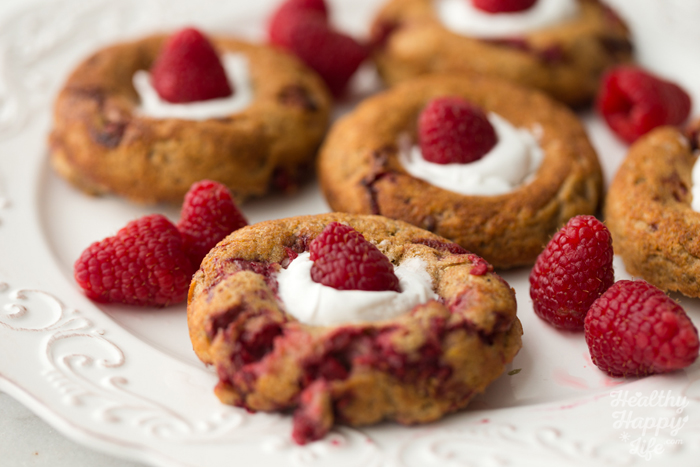 That zing-y raspberry flavor softens a bit when baked. 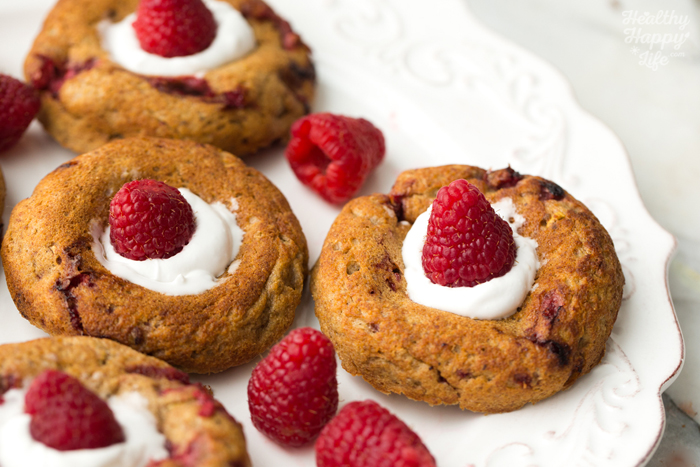 The tender oat-based donuts mingle with the bright red pops of fruit-filled color and flavor. Rich in fiber from the berries and oats and banana and chia seeds - plus rich in antioxidants and completely free of added sugars. Date-sweetened and loving it! 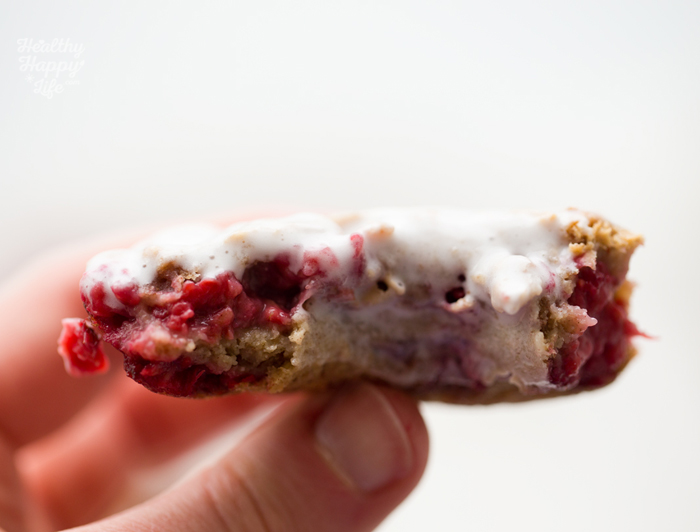 Kinda like raspberry-chia-banana-oatmeal-with-lemon --- in donut form! 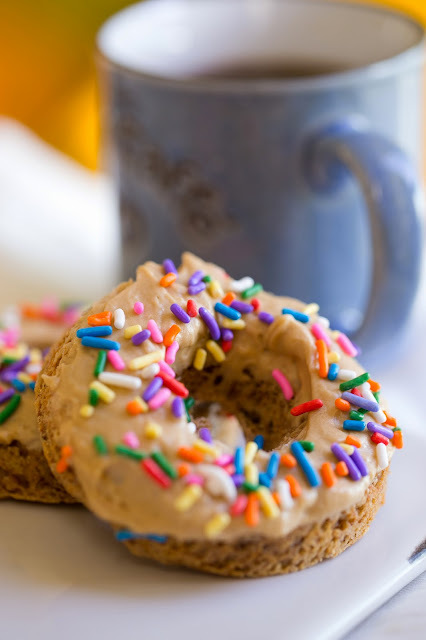 This recipe is similar to one of my fave cookbook recipes - my maple bar donuts. 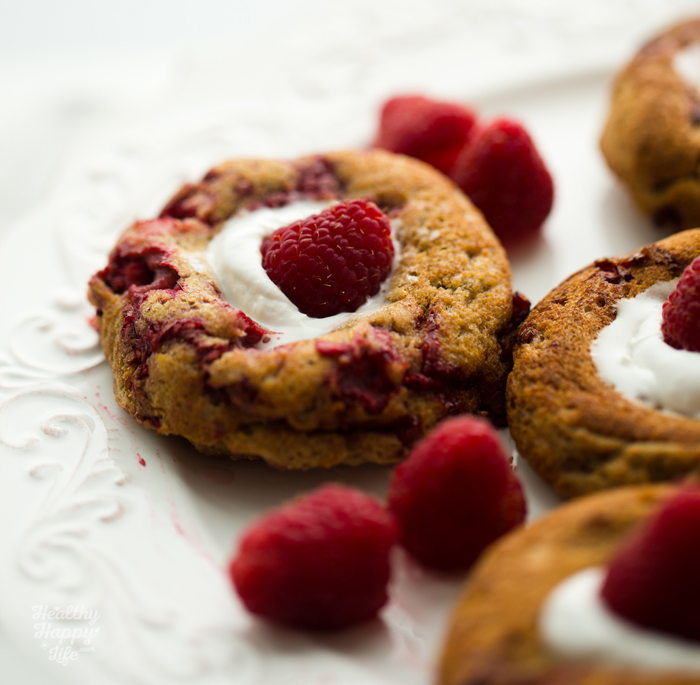 So making these reminded me of donut testing for my cookbook! 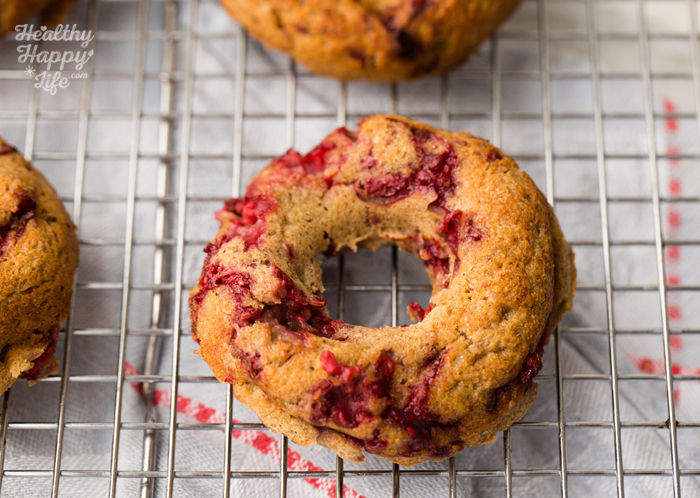 Spongy, fluffy, fresh raspberry-filled donuts with lemon essences. Gluten free and vegan. With coconut whip on top! Preheat oven to 400 degrees and grease your donuts (or muffin) pan. Add all the dry ingredients to a large mixing bowl and toss. Add all the wet ingredients to a blender and process until smooth. This will take 2-3 minutes from low to high to smooth out those dates. Fold the wet into the dry and stir well. 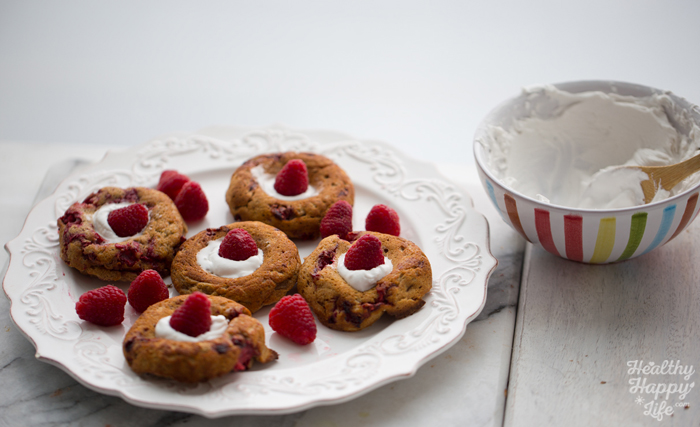 Fold in the lightly mashed raspberries. Spoon the batter into the donut pan, filling it to the brim is fine! Bake donuts at 400 degrees for ten minutes and then lower heat to 375 to bake for another 8-10 minutes or until the edges of the donuts lightly brown. Cool for a few minutes before serving. 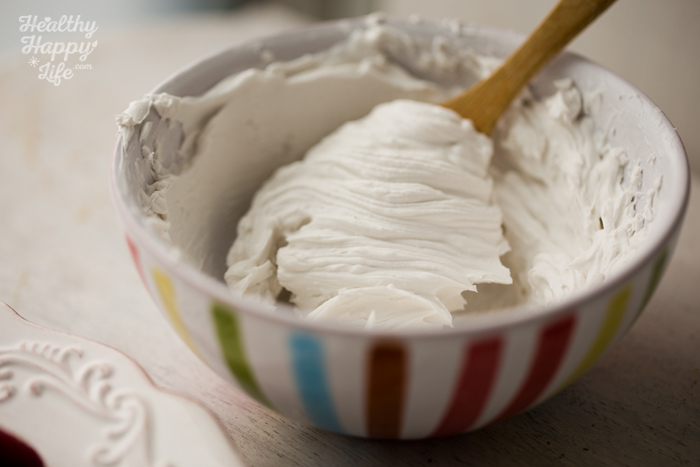 For the east coconut whip: Add 2-3 heaping tablespoons of chilled (firm) coconut cream to a small and tall-brimmed bowl. Add 1-2tsp of the wet coconut liquid (clear oily looking stuff). Beat with a beater for 1-2 minutes until fluffy. That's it! 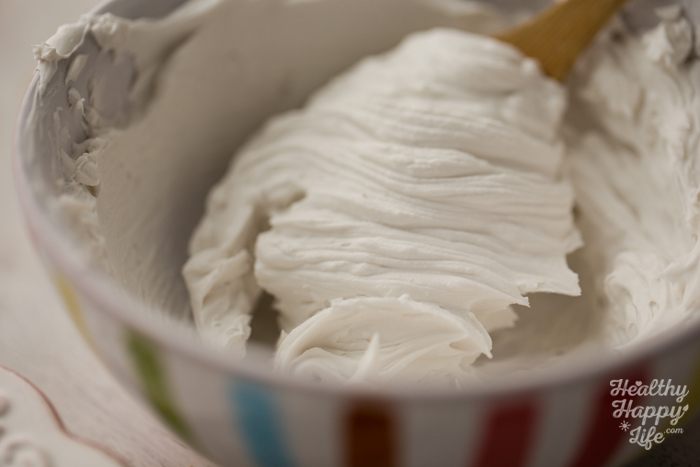 If you want a more sweet, light and "classic" coconut whip, follow this recipe. 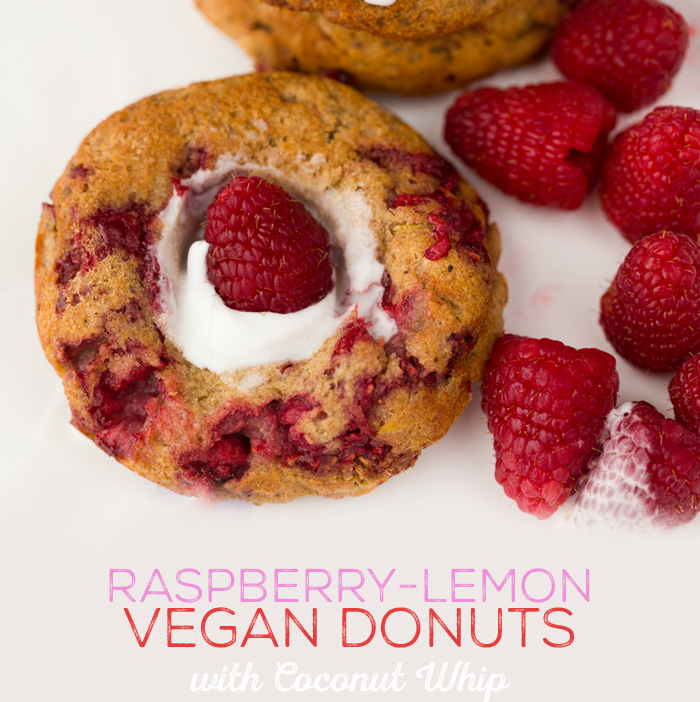 Serve donuts with a dollop of coconut whip and a fresh raspberry on top.